Are you sure you want to learn to play golf? Do you know what you are getting yourself into?? Hours and hours of practicing, hundreds if not thousands of dollars spent, and all for a thankless game that you will never be satisfied on how good you are. Yes, you still do? Me too -- I can't get enough. If you really are serious about getting into golf, I wouldn't buy this Powerbilt Dynasty set. They're a "cheapo" set that you're going to grow out of in no time. On the other hand, if you are just looking for a set to have in your closet to whip out twice a year when you and your buddies get the twinge, then I suppose this will suit you just fine. The set comes with everything you need to walk out to the first tee. The driver is forged aluminum with a graphite shaft. 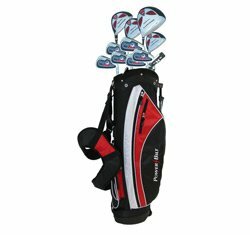 The fairway metal and the hybrids are forged stainless steel with graphite shafts, and the irons are stainless steel with a chrome finish. They are cavity back, oversized, and offset. Finally the putter is a mallet style, alloy head. If you are looking to get into this sport more seriously then check out the Adam's Golf A2 Irons which are far superior in quality and will give you plenty of growth as you get better. You could also take a look at the Top Flite XL 5000 set, which is very similar to this set but I like them better. They are a higher quality club, and most of the clubs have the True Temper steel shafts which I like better than the graphite. Golf: it's a thankless sport that will take a lot of time and money, but it sure is worth it. I wouldn't want it any other way.